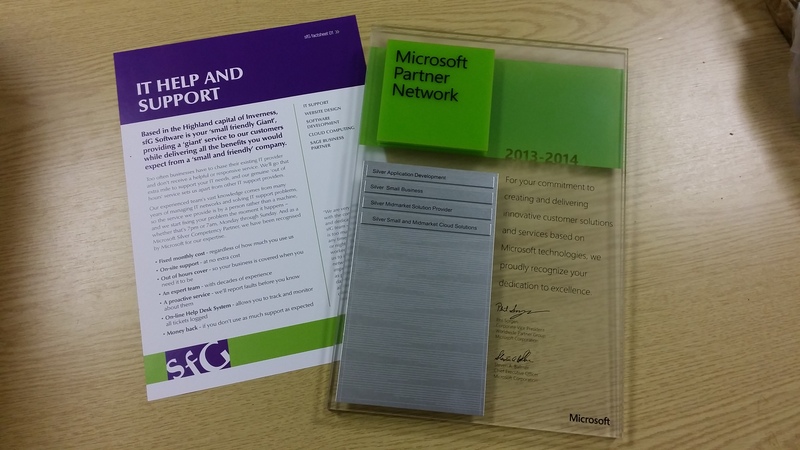 sfG Software have gained a fourth Microsoft Partner Silver Competency. The ‘Small and Midmarket Cloud Solutions’ competency recognises our team’s experience and knowledge of implementing and supporting Microsoft’s cloud services, in particular Office 365. Office 365 offers hosted Exchange (email) and SharePoint (document storage and management) services to companies of all sizes. sfG Software continues to be the only Microsoft Competency Partner based in the Inverness area. When a company signs up to be a Microsoft Partner they can prove that they have the necessary skills and experience to provide services to their customers by achieving relevant Microsoft Partner Competencies. Microsoft Partner Competencies are earned through demonstration of skills through the passing of relevant Microsoft Professional Exams, Customer Testimonials and Product Certification. Due to our location, we have to go the extra mile (well… an extra 140+ miles) to keep up with our southern counterparts. For our staff to pass the Microsoft Professional exams, they need to take a day off work and travel all the way to Stirling or beyond to find a testing centre. Contact us today for help or advice on Cloud services or any of your IT Support needs.